During the training course, participants heard lectures and engaged in practical sessions. All participants received certificates of completion at the end of the training course. Climate change adaptation and mitigation form the core of food security programs in countries where agriculture is most at risk to the effects of a changing climate. This is particularly true of countries in the Middle East and North Africa (MENA), where agriculture is an economic mainstay and is predominantly rainfed due to lack of water. How well they prepare now for unfavorable climatic conditions will determine their long-term food security. One important area is to enhance institutional capacities. This is one element of capacity development that the International Center for Biosaline Agriculture (ICBA) focuses on in MENA countries with marginal environmental conditions. As part of its climate change adaptation and mitigation efforts, ICBA has been leading a climate change modeling and adaptation initiative for nearly a decade with the aim to develop new insights into the possible impacts of climate change on water and food security, particularly in areas that are currently or likely to become marginal, and to develop innovative adaptation policy, technical and information solutions. Within this initiative, ICBA has been building institutional capacities across different countries, including Morocco, Tunisia, Jordan, Lebanon, Senegal, Yemen, Iraq, Algeria and the United Arab Emirates, which are most likely to suffer from climate change-related impacts. Under this work, ICBA organized a training course on 24-27 September 2017 and a workshop on 28 September in Algeria in collaboration with the Algerian Ministry of Agriculture, Rural Development and Fisheries (MARDF). Supported by the Islamic Development Bank (IsDB), the training course and the workshop were held at the National Institute for Plant Protection "INPV”. About 20 participants, including 17 from different institutes in Algeria and one participant each from Mauritania, Morocco and Tunisia, took part in the four-day training course titled “Adapting to a changing climate: Exploring future climate conditions and crop and water management solutions”, while the workshop was attended by over 15 participants from Algeria. The training course, conducted by ICBA scientists Dr. Makram Belhaj Fraj, an agronomy scientist, and Mr. Rashyd Zaaboul, a climate change modeler, included lectures and practical sessions on how to access and use observed climate and downscale global climate change data to national and regional levels. The participants were given a presentation on a drought monitoring system developed by ICBA in partnership with the University of Nebraska – Lincoln to show how to create monthly maps in the shortest possible time to monitor drought using software, and analyzing and comparing current and previous droughts. 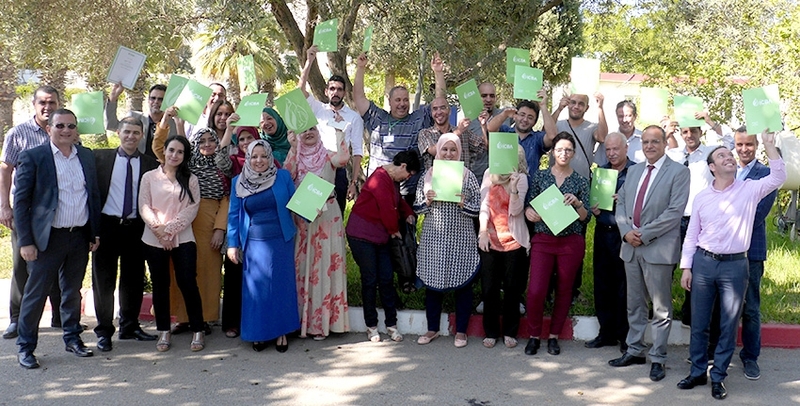 “This training course is an opportunity for Algeria to exchange experience with other North African countries and to learn about the advanced technologies on climate change mitigation,” Mr. Hameed Ould Yousef, a training manager at MARDF, said. “All lectures were excellent and gave us information on the efforts taken by experts at ICBA and in the region. 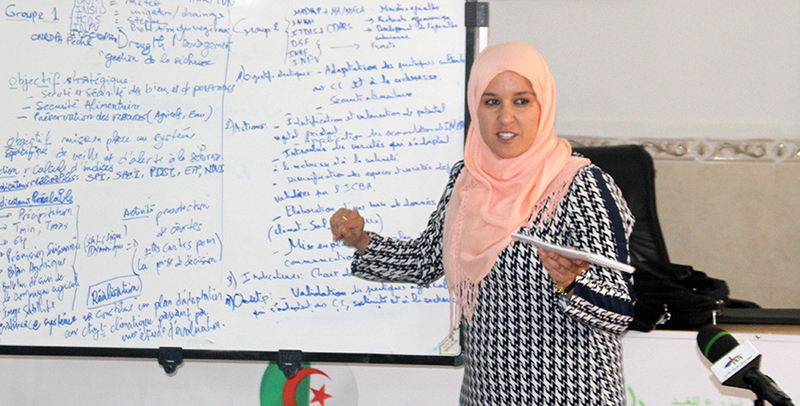 I hope that this training course will have important results for Algeria and other Arab countries, so we can work together to find solutions to climate change,” Ms. Souhila Hocien added. “I am sure that the major objective was achieved and guess all participants, which were proactive during all sessions, acquired skills at the end of the training, which surely would help them in their respective tasks,” said another participant Dr. Sidi Ely Menoum from the Directorate of Development and the Agricultural Council Nouakchott, Mauritania.